At the Party Bus Group, we believe in creating long term relationships with our customers, and we take every possible step to make sure that you receive a flawless service on your party bus rental in Pomona, CA. With more than fifty thousand satisfied customers to date you’ll know you’re in safe hands with your Pomona limo bus rental! We own and operates all of our vehicles and truly care about our customers unlike many brokers out there, and with a brand new fleet of vehicles ranging from 15 to 50 passengers we have your Party Bus Group covered! 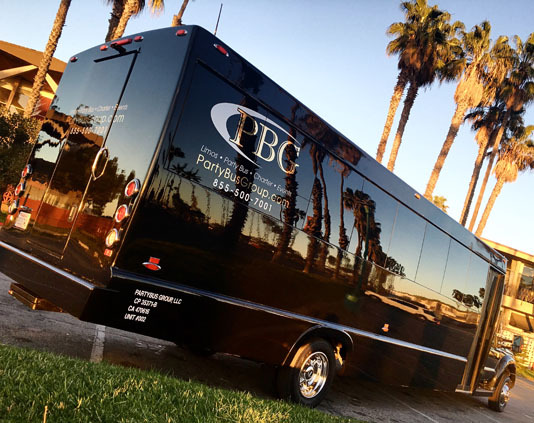 Give PBG a call today for the best party bus rentals in Pomona or nearby East Los Angeles! There isn’t another bus rental company with a better reputation than us. See our reviews on sites like Yelp, Thumbtack or top wedding sites like The Knot. We are also registered with the National Limousine Association (NLA) and the California Public Utilities Commission which means we are fully licensed and insured by the State of California. We are not a broker, we operate our own fleet of SUVs, limousines, sprinters and party buses for any event, so you can be sure you are getting the best rate for your bus rental in Pomona directly with us! WHY RENTA A PARTY BUS IN POMONA WITH OUR COMPANY? Designated driver: No worrying about traffic, parking, or anything really. Just sit back and drink a cocktail or two and we’ll handle the difficult stuff. Convenience: Our drivers will pick you up anywhere in the area and at the end of the event we’ll drop you off right at your door. It’s easy to book your party bus with us. Party goers can simply visit our website or give us a call! There are plenty of transportation options especially if you’re looking for party bus rentals in Pomona, CA. With Cal Poly Pomona, local breweries and concerts there are plenty of events. If you decide to you choose a provider for the best service at the best party bus prices, look no further than the team at PBG. Call us today to for your next party bus rental near Pomona, CA.